Batley Bulldogs are raising funds to have a new electronic scoreboard installed at Fox's Biscuits Stadium. 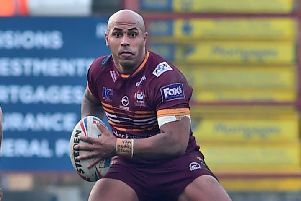 Batley Bulldogs have received a timely boost as they bid to raise £20,000 to install a new electronic scoreboard at Fox’s Biscuits Stadium. Long time Batley supporter and the main club sponsor, Stan Whittaker, of Morley Waste Traders, has pledged to match Bulldogs’ fundraising efforts pound-for-pound, guaranteeing them £10,000. Essential ground work would need to be carried out before the scoreboard can be installed and with previous fundraising efforts already raising £5,000 for the ground development fund, the Bulldogs are now just £5,000 short of their target. Bulldogs chief executive Paul Harrison said: “The Whittaker family are truly great sponsors of our club and this is a tremendous gesture by Stan to help us achieve our goal. Chairman Kevin Nicholas explained: “For us to progress we have to meet minimum ground standards set by the RFL, one of which is an electronic scoreboard.